Today i will talk about one of the Boiko costumes, that of Turka county, which is the best documented. The Boiko region covers three counties in L'viw Oblast, plus the mountainous part of Ivano-Frankiwsk Oblast, west of the Hutsul area, and the extreme southeast corner of Poland, east of the Lemko area. Drohobych and surrounding areas are also sometimes considered to be part of the Boiko region. 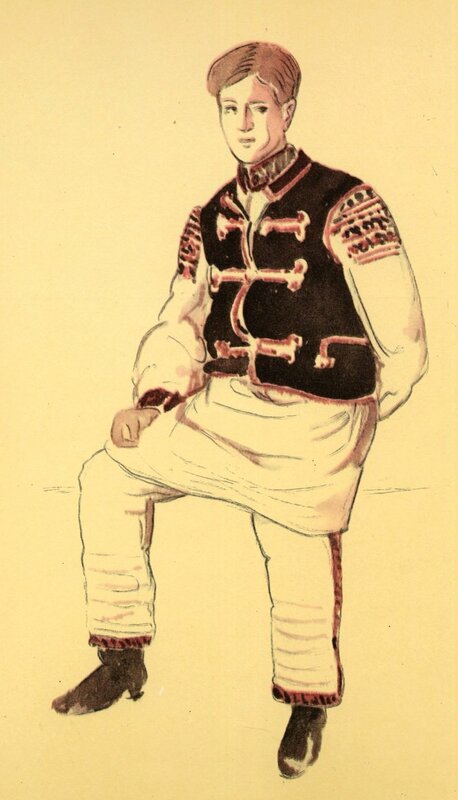 Some Boiki do not like the term, preferring to call themselves 'Verkhovyntsi', or 'Highlanders'. Here again is our map of L'viw Oblast so you can orient yourselves. I should start with a photo giving a good view of the costume. 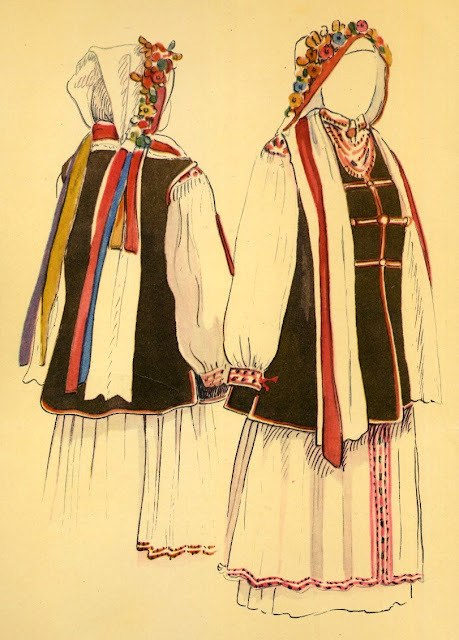 When Orest and Cheryl got engaged, our dance group [the Omaha International Folk Dancers] decided to make them a set of costumes from this region, because Orest's father is from the village of Berezhok-Zhukotyn' in Turka county. I came up with the idea, researched the costume and organized the project, but everyone helped. Somehow we managed to [almost] complete the costumes in time for the wedding without them finding out. Here is a photo from the wedding reception. 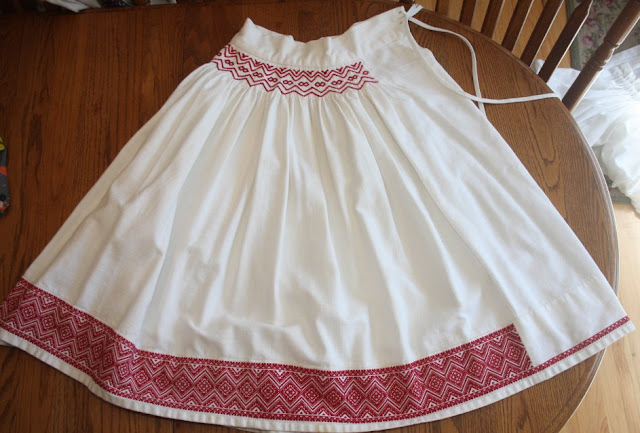 The embroidery on her apron should extend all the way to the edge, which has since been rectified, but otherwise the costume was complete. Today i will show you their wedding costume, andin a later post i will add some other material that they collected from his father's native village. Here is the chemise which we made for her. 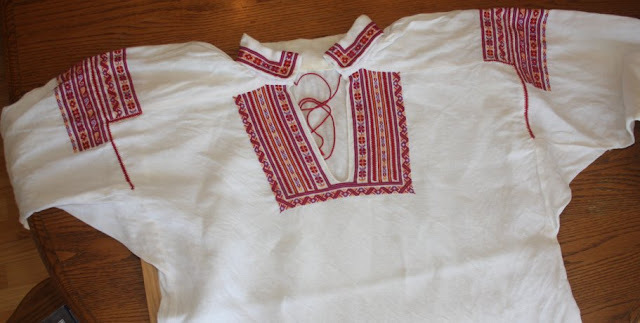 ﻿Turn down collar, embroidered inset on top of body piece, smocking and embroidery on top of the sleeve. 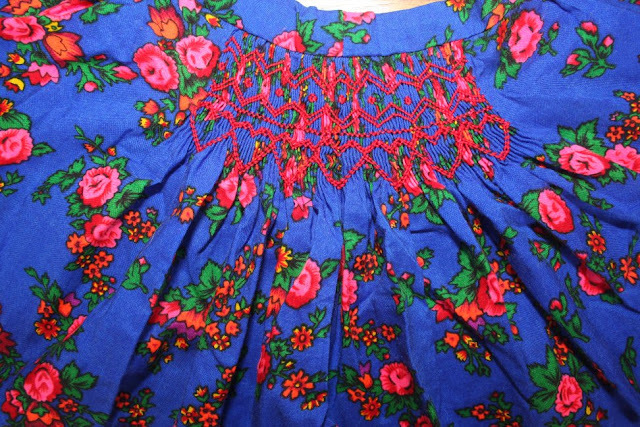 Smocking is very typical of this region, and forms part of the embroidery design. 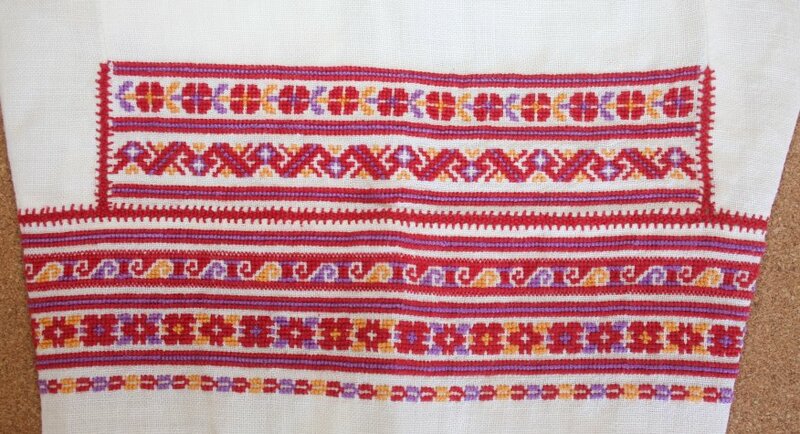 Here is a closeup of the inset [ustawka] embroidery. 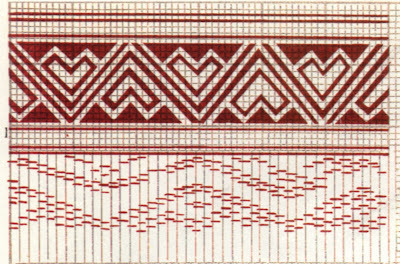 Nyz, or darning stitch embroidery, which in this region is not necessarily filled in with other colors, with border in braid stitch and cross stitch. I got this design from Krawchuk. The smocking and the bit of embroidery framing it are quite typical of this region as well. 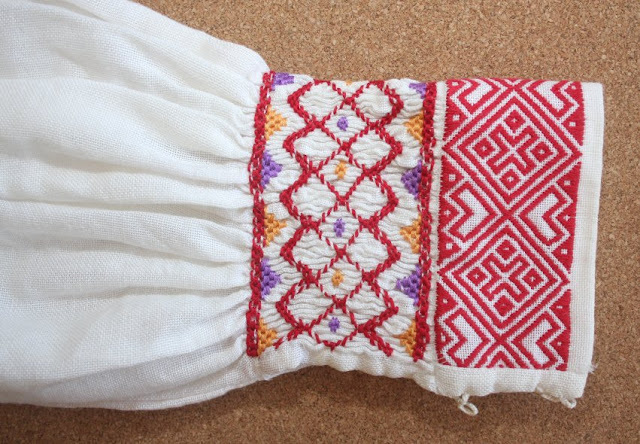 Here is a closeup of the lower sleeve and cuff. 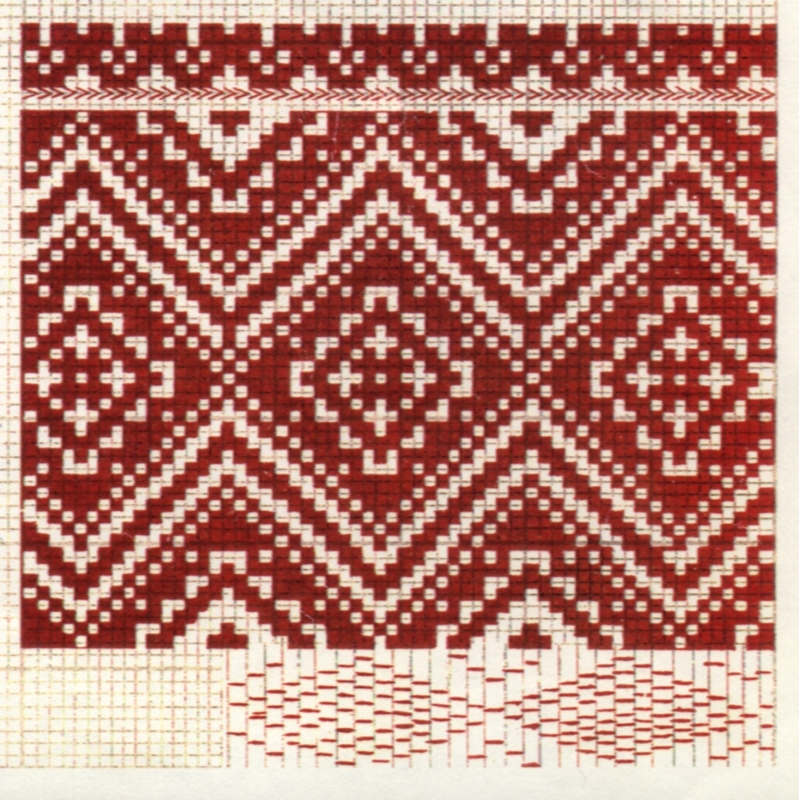 If i was doing it today, i would put a backstitch frame around the embroidery on the cuff. 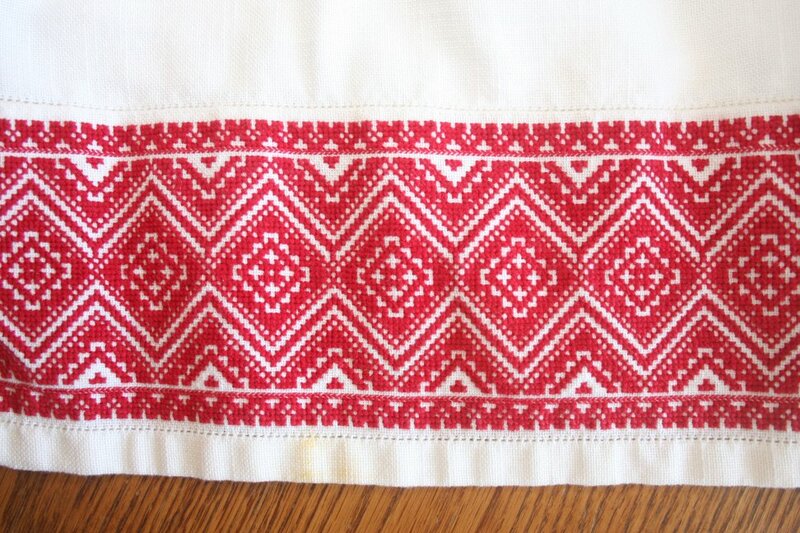 Here is a a closeup of the embroidery on the collar. 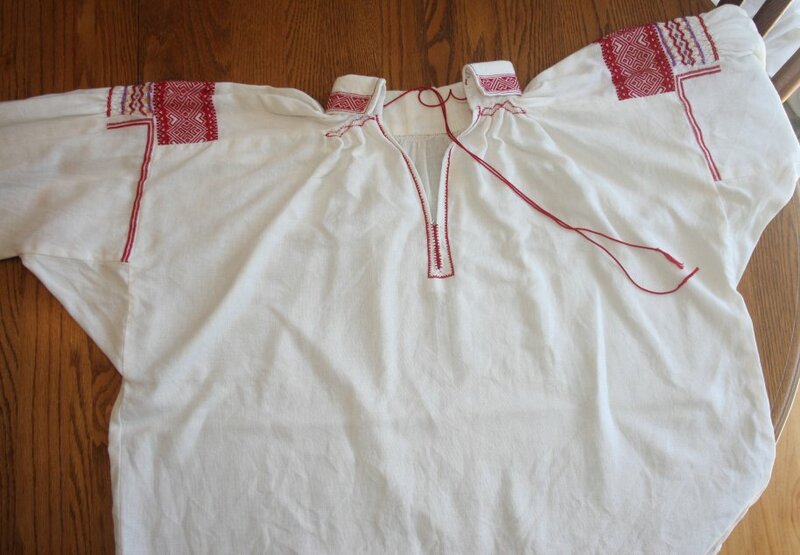 You can see that the body of the shirt is smocked into the collar, front and back, but not on the ustawka. We had to guess at the collar measurement, and we made it too small, so she added a piece in back. In Krawchuk, this design was originally for a cuff, with smocking on the sleeve. 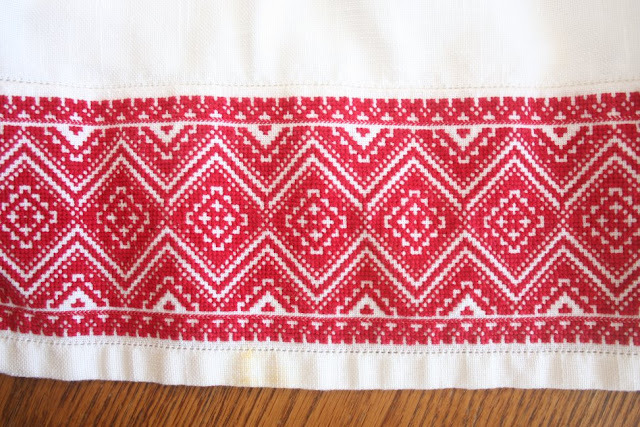 The skirt would be the maliovanka for every day, with a design more black than white, see the photos in the posting about the Drohobych costume. 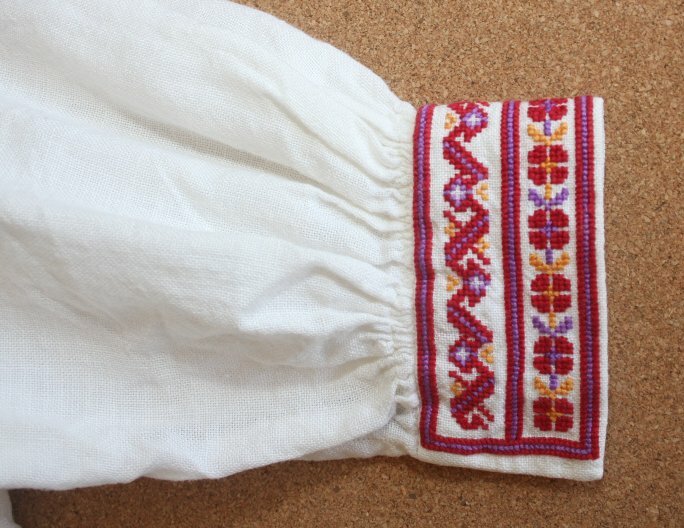 For festive occasions, the skirt was linen, made of four or five loom widths, the ones in back being embroidered and gathered and also smocked into the waistband, and the fourth left smooth and plain in front. Here is Cheryl's skirt. The opening is in the middle front, and the skirt was tied around the waist by cords pulled through buttonholes in the waistband. 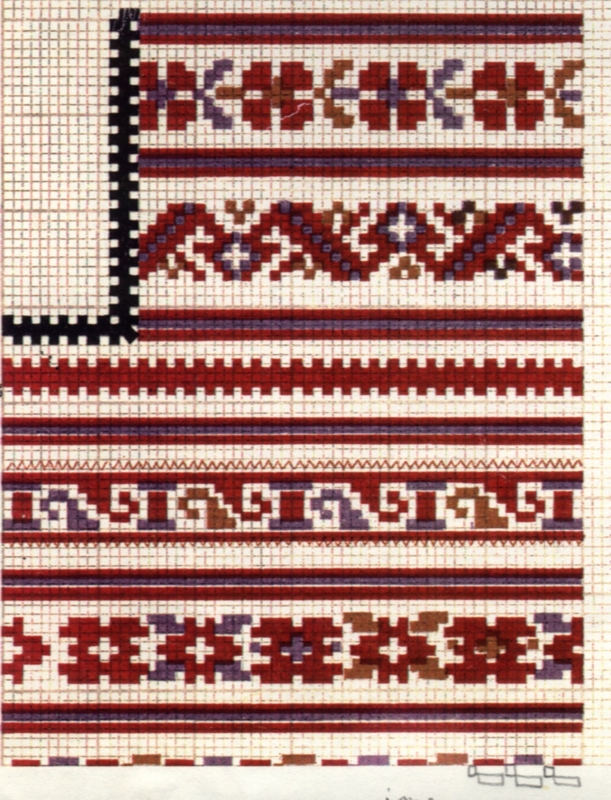 Here is a closeup of the embroidery, cross stitch with some braid stitch which I also took from Krawchuk. The graph shows this as the shoulder inset, with smocking embroidery on the upper sleeve shown at the bottom. We put the same embroidery on the apron. 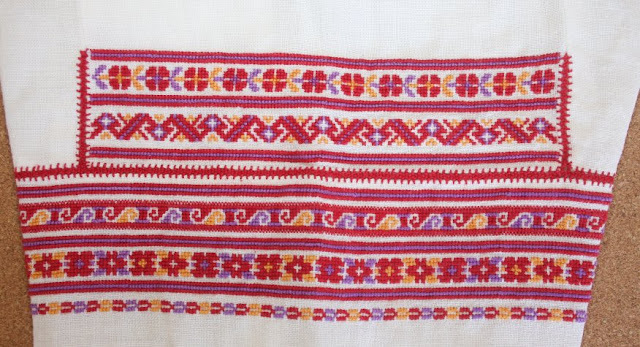 The apron, as in other parts of Halychyna was made of two loom widths joined in the middle by a decorative stitch. 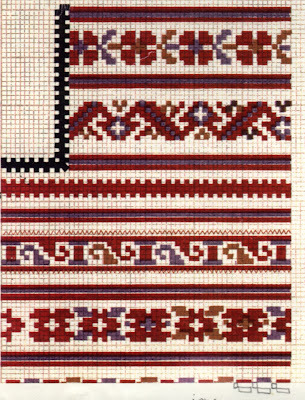 I had wide material, so i made it in one piece, but put the joining stitch on the surface, so it would look traditional. And, as i promised, the embroidery is now complete. Cheryl took it and finished it. 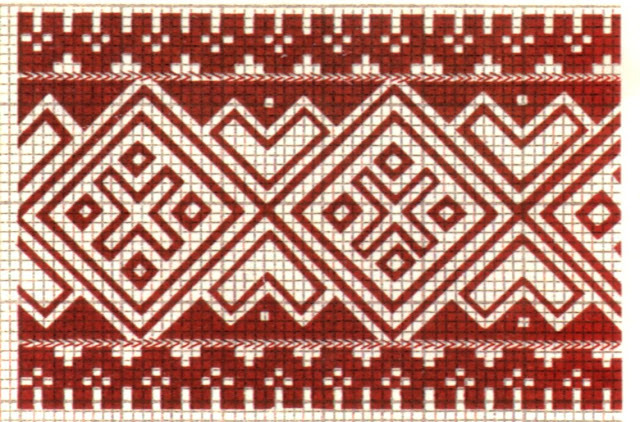 I took the edge design and turned the corner with it to run on either side of the central joining stitch. I also put a row of merezhka hemstitching on either side, and of course to join the hem as well. 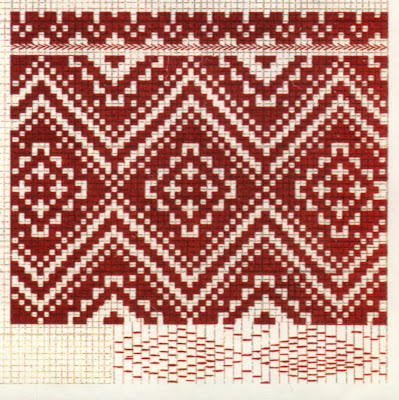 This is often done to finish embroidery compositions. 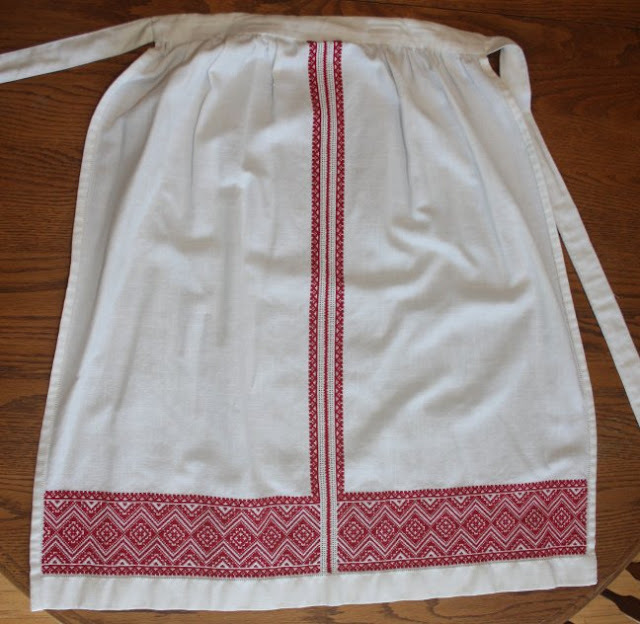 We made a second apron from challis cloth, just for variety, this was commonly done as well. 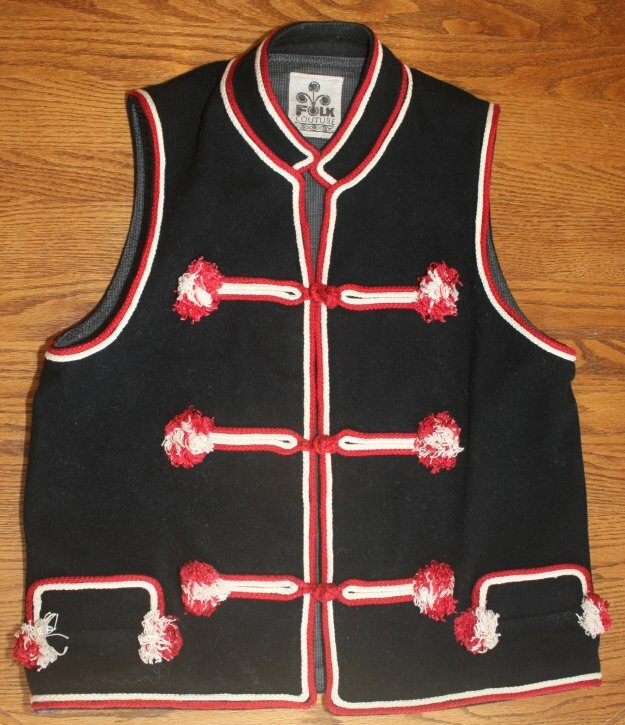 The middle front of is smocked. 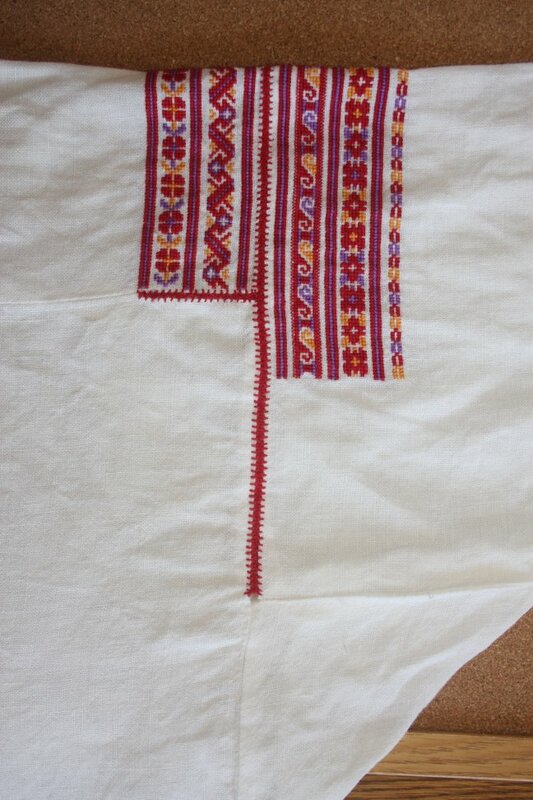 This is one of the few regions where the men's shirts are traditionally embroidered on the shoulder inset. Here is Orest's shirt. 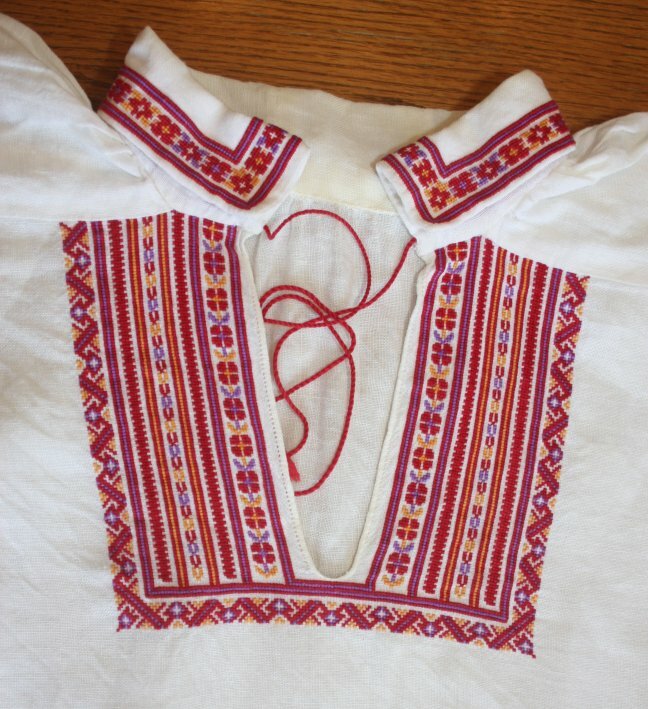 It is made with the same cut as the women's shirt, which is typical of Halychyna. 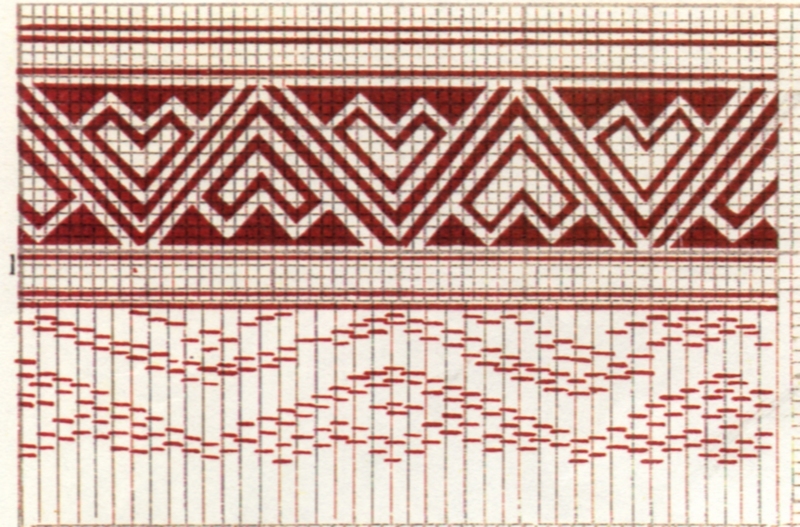 We made an attempt to choose embroidery designs that harmonized between the two. Here is a closeup of the shoulder inset and upper sleeve embroidery. 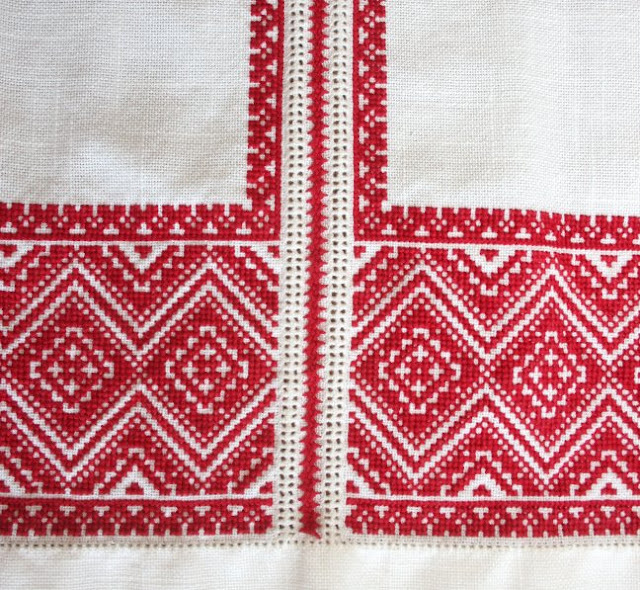 The embroidery is cross stitch, with a decorative joining stitch holding the pieces together. Here is another view. 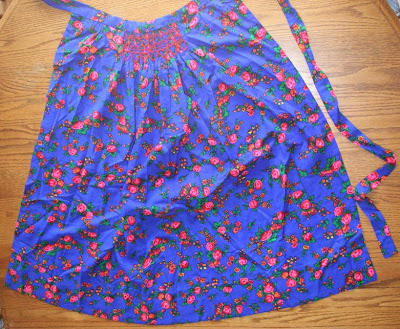 If i were making this today, i would have some small framing embroidery on the sides of the sleeve. I took the same design and altered it to make the embroidery on the cuffs, collar and front. The ties to close the shirt were sewn into the seam. I made the ties by twisting the same floss i embroidered with. 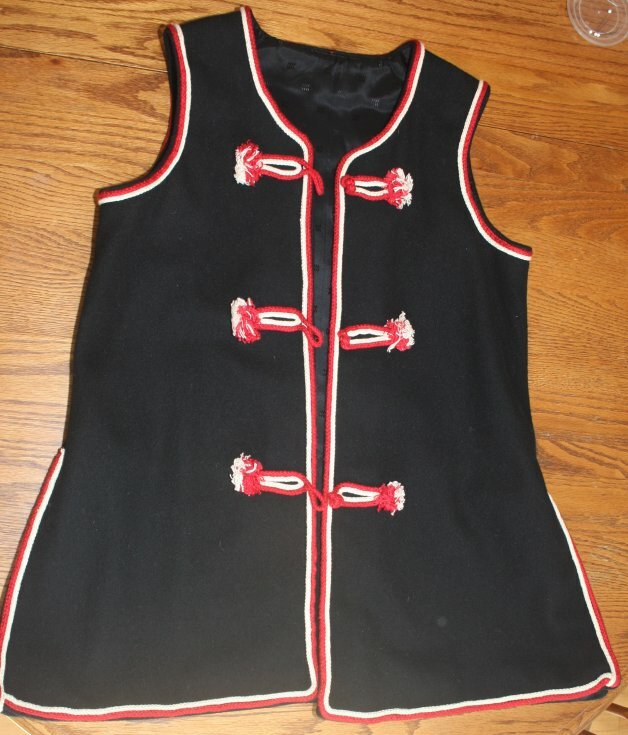 Then we made the vests, very similar for both, except Orest's is short. Actually we had his made to order by a woman who did sewing, her company name was Folk Couture. We had our hands full finishing the embroidery. 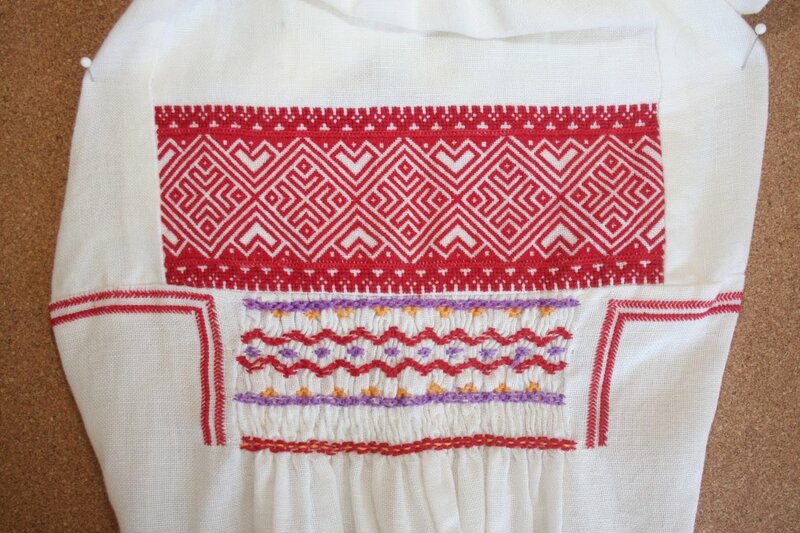 Both vests are finished with red and white cording, with loop and knot closures. Cheryl's is longer, and is slit on the sides. Just for verification, i would like to post two drawings by Kul'chytska. Thank you for reading. I would like to thank everyone who participated in this project. If you would like to be mentioned by name, let me know. You know who you are. I decided to err on the side of privacy. I hope that this may inspire someone else to undertake such a project. The photos were taken by Orest Lechnowsky, and the costumes are obvioulsy part of his and his wife's private collection.